I wrinkled my nose at the thought of the retting pond. “Just do not have it dug too close to our windows!” I said, recalling the stench the decaying flax gives off. 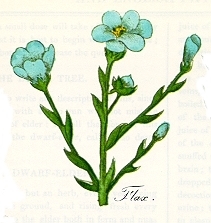 The lovely blue-flowered common flax, linum usitatissimum, is the source of that cool and sensuous fabric, linen. The tight grain of the slender flax fibre lends it a pleasing ‘oiliness’ which makes even roughly-texured linen glide smoothly over the skin – and so makes a linen handkerchief much kinder to the nose than a cotton one. Throughout Europe during the Middle Ages linen was used extensively for shifts and tunics under wool gowns and mantles, for towels, and of course, sheets and pillow slips – true ‘bed linens’. Flax was prepared by pulling the long-stemmed plants and spreading them either in a mown field where they would catch the dew, or soaking them in a vat or pond – the ‘retting pond” that Ælfwyn and Ceridwen discover. Action of water or dew rots the outer stem (hence the aroma that Ceridwen warns Ælfwyn about). Field retting is slower – three to six weeks versus the three to five days in the pond – but yields a white flax thread; flax soaking in a retting pond discolours slightly from the rotting stems. The decayed outer stem is then stripped off, and the flax fibres hackled, or combed. Spinning comes next, and then weaving. Linen could be bleached to a snowy whiteness through the process of bucking – soaking or boiling the woven yardage in lye. Natural bleaching was accomplished over the life of the cloth by hanging up to dry in the Sun. 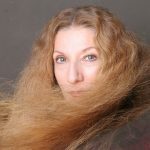 Beyond linen, flax had many other uses. Waste flax fibres, tightly twisted together, were soaked with liquid beeswax or tree resins and burnt as torches. Candle wicks were braided cordage made of flax fibres. Saddlers used strong flax thread to stitch leather saddles, bridles, and horse harnesses. The silky strands of the flax plant were oft-times compared to hair – a ‘flaxen haired maiden’, or a ‘tow-head’ referring to a blond approaching whiteness (tow being the short, coarse fibres of flax not used in the higher grades of spinning). Pure linen sheets are a sensible luxury – a well-woven set will last your entire lifetime, and you will leave them to a favoured heir in your will as so many Anglo-Saxon women did. Machine wash in cool water and hang to dry. Unlike much that may enter your bed, they will not disappoint.